The property planning consultancy team was appointed by one of the UK's most respected regional construction companies, Bouygues UK, to negotiate and secure planning permission for a new 40-storey mixed-use development in Portsmouth. The development, situated on The Hard near Gunwharf Quays, will replace a derelict building called Brunel House, and will comprise a 40-storey landmark feature building with over 300 residential units, over 600 student units (C1 use), and 14,638 sq. ft. of retail use with a multi-storey car park. 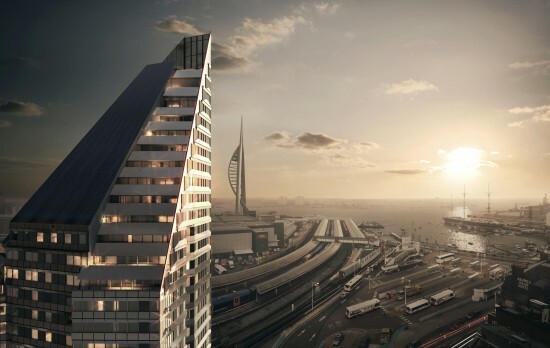 The proposed development will be characterised by a glazed frontage to create a stunning landmark building for those entering and leaving Portsmouth city via The Hard Interchange. The expert property planning consultants at Vail Williams advised Bouygues in relation to the planning application, viability of the project, planning contributions (including Community Infrastructure Levy), Environmental Impact Assessment Screening and also undertook negotiations with the Local Planning Authority. Due to the tall nature of the building, which would stand at 40 storeys in height, Vail Williams had to undertake a viability assessment to ensure that a building of that stature could be accommodated in the city centre location. The proposed site had been allocated for a hotel, so our property planning consultants needed to prove that a hotel on the site was not a viable option, whilst also providing for enough open space to meet with the requirements for the site. This was challenging due to 100% of the site taking built form. As a result of the intervention of the planning consultancy and development teams, Vail Williams was able to successfully negotiate and justify the viability and practicality of the project, in order to achieve planning approval. The team also provided advice in relation to public consultation to help gain public support for the project, and drafted in-depth planning statements and a Community Infrastructure Levy form to ensure the best possible outcome for the client.